If you didn’t see it, you might have heard about it: First standing O of the day . . . 80,290 views online . . . featured on WOSU TV’s TEDxColumbus special . . . The talk, Austin Channell’s A Culture of Obsession: Why taking choir kept me from being valedictorian, was even retweeted by preeminent chorale composer Eric Whitacre—making Channell, for one hot moment, a hero among Central Ohio choir directors. It all made for an interesting senior year of high school for Austin Channell, who never expected to be juggling his class schedule with an appearance on All Sides with Ann Fisher or piggybacking a college visit onto a speaking engagement in Virginia. Now a high school graduate, Channell finished third in his class, but was not a valedictorian. As he says, “that would have been awkward.” In the fall, he’ll attend Vanderbilt University, where he plans to study civil engineering. It’s not that he had some great ambition to be a valedictorian, as he says, “It was the principle of the thing.” And the problem is bigger than just some nonsensical grade point system. At issue, is the larger and more complicated matter of how we choose to define and measure success, and the resulting effects on college-entrance, and the self-esteem, health and well-being of our youth. For students, it can lead to some silly scheduling maneuvers—going to art class while officially signed up for study hall. But if college is going to be in the picture, GPA is vital, and even as current business-speak extols the virtues of failure while the social sciences send out alerts about the dangers of perfectionism, students know exactly the fine line they have to walk. If an A in a non-AP class can reduce GPA or just one B can plummet a class rank from one to one hundred and something, an example Channell shares, why take a risk? Or follow an interest? Maybe the student truly is that much less smart or less studious than before the B, either way, at many colleges, her application’s gone from the top of the pile to the slush pile. Grading—how it varies between districts, schools and teachers and what exactly it measures—is not just a complicated puzzle for administrators. Channell is telling us it’s having real effects, adverse effects, on real lives. Another reason for the overwhelming response may just be that Austin Channell did a really good job. And were I to add “for his age” it’s not to put a qualifier on his abilities, but to acknowledge age is a factor. 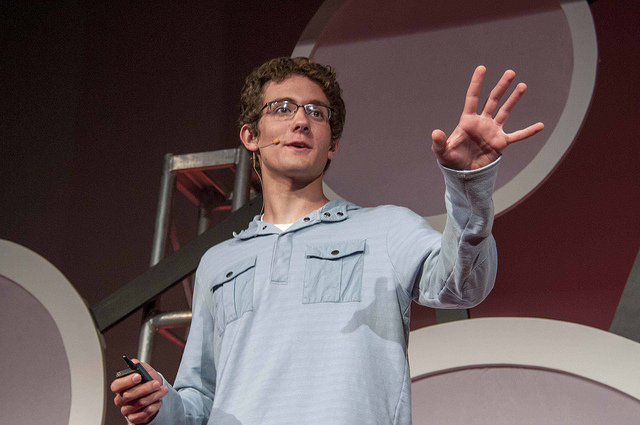 Though he doesn’t attempt to offer a solution, and while people are listening and talking no changes have yet been made (though his school board just announced it will be reviewing the valedictorian system), still in Channell’s TEDx talk there is hope. Because despite everything we have left the next generation to grapple with, if they still come out smart, articulate, principled and mature, there’s definitely hope. If this whole experience has been a bit disorienting for Channell, it’s also been humbling and motivating. Amazed by how far and wide the talk has spread, he also wonders if maybe he should have put more into it—more than writing it during an 11th period study hall, he confesses. This concern comes from the perfectionist in him, but also from a real sense of responsibility. He has no obligation but to go off and be a college student and pursue his interest in civil engineering. But that’s not how he’s feeling. “I don’t know what form it will take or what point in my life it will happen,” he says, but the issue is not behind him. By sheer coincidence, Vanderbilt is home to Peabody College, the best graduate school of education in the nation. He’s already made contact, though just out of curiosity. He does say that, in his mind, from civil engineering to education is not a huge leap. “Civil engineering is about creating and maintaining systems. Though more infrastructure related, it’s borderline policy,” he says. Plus, he’s never been one for purely technical pursuits, being more macro- than micro-focused. The system of education is one of many things he’s looking forward to potentially exploring in college. But for the moment, he’s got his graveyard shift at a truck parts warehouse. Spending his summer laboring alongside mostly fulltime union workers, ”I put parts in boxes,” he says, “I close the box and put a shipping label on it.” He’s in it for the money—“I know I’ll be poor in college, but my goal is to be less poor in college”—but as a side benefit, he’s listened to a lot of audio books. One night that audiobook was The Ghost Map about a cholera epidemic in 1854. “If you want to get strange looks from people, just listen to a description of someone suffering from cholera,” he says. When the guys around him asked what he was listening to, it blossomed into a group discussion about medical issues and the scientific process. “Turn it up,” someone suggested, and at 10:00 on a summer night instead of a muffled din of rap, metal and various podcasts, blaring inside this truck parts warehouse was a story about disease and sanitation in mid-19th century London, England. Yet another unexpected and interesting experience in what has been an unexpected and interesting year for Austin Channell.